I had the most amazing time working with my best friend and future daughter-in-law to create an underwater adventure for my daughter, who turned 9 this year! I am always very teary-eyed when I see just how much my babies have grown each year, but this year especially has been tough as she is starting on her journey out of the babyface. With each picture I take of her, I notice that she is getting older and older. So, for as long as she will let me, I will make her birthday parties memorable! This year, the theme is Mermaids. She chose this theme because we will be building her a room of her own and she wants it to be all mermaids. So she asked her friends and family for mermaid decor and art supplies, and boy did they deliver! So, let’s dive into this adventure together. We searched everywhere for invitations that would live up to the standards she was searching for with this party. After searching high and low, we came across these blank cards with a shimmery cover that we both felt looked like mermaid scales. We then let our imagination move forward when she found this sparkling teal washi tape. But we weren’t done yet, we looked in the duct tape section and found the colors she had been looking for and in the design, she was looking for. I had no clue how all of this was going to come together, but as soon as we got home, we started brainstorming. The first thing we did was add a strip of the mermaid scale duct tape to the inside of the card. The thing we noticed when we did this was the natural feel of duct tape with the pattern we chose, made the entire scales come to life and feel realistic as you slid your fingers across it. We then decided to write “You are invited!” on the sparkled teal washi tape. The one thing I will say is that none of my fineliners would work on this tape, I’m not sure if it was because of the texture on it or what the deal was, but the only thing I could get to write on it was a bullet tip sharpie. I then let her choose from a large number of colors for the actual information text on the invitation. She chose this beautiful shade of purple that really just made the invitation perfect. We ended up making 30 of these and giving them out to all her classmates and her other friends. Typically I go all out on the decorations, but I didn’t get that far this time. I hung up a Happy Birthday banner that I had already saved from a previous birthday celebration. I also had many balloons. I hung outside on our lamp posts for people to know where the party was and then bouquets over the gift table, the food table, the adult table and the craft table. Other than that, there were some loose balloons around for the kids to play with. We searched everywhere for mermaid stuff and we couldn’t find it anywhere. The few decorations I did find, I ordered off Amazon, I had a tablecloth, plates, napkins, and a centerpiece. There wasn’t much but we accomplished a lot with the little we had mixed with what I had left over from previous parties. Let’s start out with the basic essentials that I didn’t put much effort into at all. 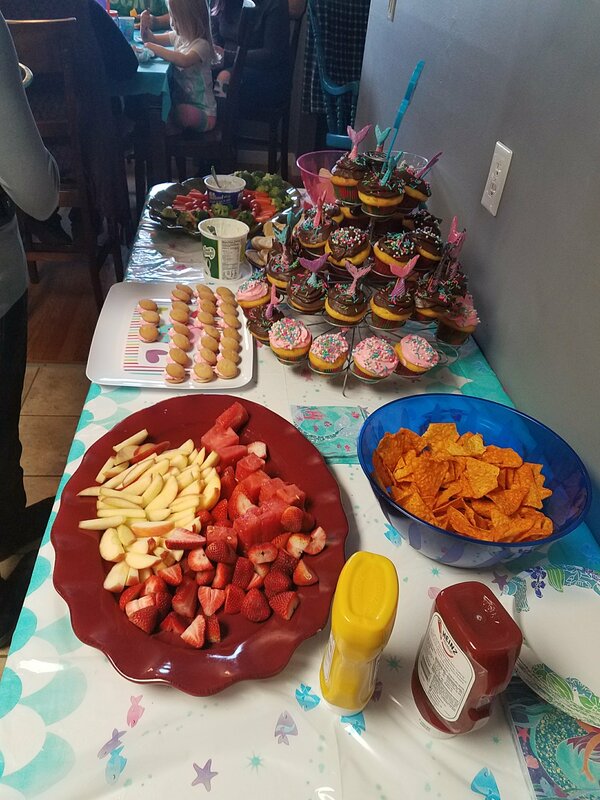 There was, as always, a fruit tray, a veggie tray, two types of chips, sugar cookies, and hotdogs. Those were straight out of the packaging food I offered. Typically, I overdo it with food, but I had no leftovers at the end of this party, so I am glad that I did offer so much. Now onto the things I did work hard on. These were so super yummy and a huge hit. I grabbed two bags of pretzel rods from the store and I also purchased CadiQuik chocolate. After heating the chocolate I started to dip the pretzels into the chocolate, white and milk chocolate, and then laid them out on wax paper to harden before I decorated them with colorful candy melts. I highly recommend getting the candy melt squeeze bottles, it made these projects so much more smooth. These cookies were so yummy and quite easy to make. First off I made the home-made cream cheese icing which consists of two sticks of butter, three 8oz packages of cream cheese and 6 cups of powdered sugar. Let me just tell you, this icing was a hit and I’m really happy that I learned an easy way to make it because we ran out of icing for the last few cupcakes and improvised with this icing. The assembly is quite easy. Lay down a vanilla wafer, squeeze on a layer of icing, close it with another vanilla wafer and push in a Sixlet pearl on one side. They turned out amazing and were a big hit as well. The cake, or in this case, the cupcakes are always a huge deal for me. You can read about why I prefer cupcakes over cake here. I wrote about it on my mom blog if you’re interested. Moving on. Yellow cake and chocolate (some cream cheese) icing. The most interesting thing about these cupcakes is the candy melt mermaid tales that were sitting on top of them. As you can tell, they came out amazing. I was actually surprised at how easy they were to make. I had purchased some silicone molds from Amazon that came in a 4 pack to include two smaller and two larger molds. In total, I had 41 cupcakes to decorate. We decided early on that with only four molds, it would take us all night to get all the tales made, so we would only do 20 tales and leave the other half of the cupcakes decorated with sprinkles and candy pearls. Using the squeeze bottles I mentioned above, we squeezed the candy melts into the molds and let them sit in the refrigerator for about 15 minutes to harden. We then popped them out of the mold by folding the mold backward which allowed the tale to slide out without a breaking. After all the tails were done, we decided that dusting them with edible glitter would just make them look so much more realistic, and it didn’t take barely any to make them shine. We wanted to make sure that each tail was different from another so we started to have fun mixing colors and designs as well. As far as entertainment is concerned, we allowed the kids to go outside and play until their little hearts were content. After presents and cake though, we started on a painting project. The kids were all excited because they could have something to take home. I purchased a six-pack of plaster underwater sea creatures for each kid to choose and decorate. I had paints and glitter glue as well so that they could personalize them completely. These pictures are of my toddlers’ painting, they had a blast and I really enjoyed that this project was fine for kids of all ages. Once they were done, I placed each piece in a plastic cup for them to take home so that they would have the chance to dry and not get messed up along the way. Overall, the party lasted about two hours and everyone had a great time. This is a theme that I can see myself doing again in the future for sure, but we will have to see what comes my way. I love the challenge that my kids present to me when they decide the theme of the party because I love the look on their face when I achieve their dreams with creativity. I would love to know what your favorite part of this party was in the comments below. If you would like more details on anything you see in this post, please don’t hesitate to ask me and I will create more of a tutorial for you. They were really easy to make too!